Hi, just a quick post today. I made this card for a friend that had neck surgery recently. Thankfully he came through with flying colors and is not experiencing the dreadful pain he was having. The stamp is from Cornish Heritage Farms. I used a new DCWV stack called Naturals. Hope you had a great Wednesday, gotta get some sleep now. Thanks for stopping by. See you tomorrow with a card with one of the new Tildas from Magnolia, she is beautiful. What a fabulous image! Sooo perfect for a man's card - especially after being given the "Sue" treatment! Hello sweet Sue~ this card is great. It is masculine but actually one that any dog lover would love to own. Beautiful colors & I really love the dog. As always- beautiful job. This is a beautiful card... 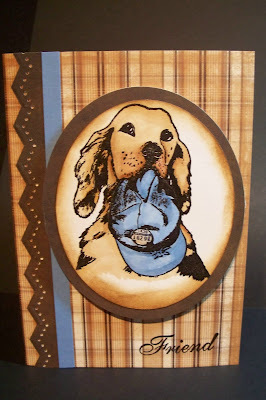 I love this cute motif and the design you made!